The location! Little corner/grocery stores all around and good restaurants as well. The appartement is functional and can accommodate adults and kids. Everything that I was expecting happened . Carlos was extremely helpful. Apartment had everything I would expect. Centerally located to restaurants and sights . Great location. Extra night with no trouble. Would recommend and stay again. Great location near restaurant row and easy access to Times Square. Excellent location, small but clean. Each bed room slept 3 people... a double bed and a single bed. Has free wifi, air conditioning and fluffy towels. Really quiet too... no noise from the neighbors. Easy walk to Central Park, tomes square, and cruise terminal. Lots of restaurants within arms reach too! Convenience of checking in, location and cleanliness were great, but of the three LOCATION, LOCATION, LOCATION!! If you are planning to do Broadway, Carnegie Hall, Central Park, MoMA, etc. etc., this is the place to stay. Everything is within walking distance and the subway is just a few blocks away. The host was very friendly and attentive. The apartment smelled clean the bedding was comfortable. Maurize, the Host was very nice and a pleasure to deal with. The apartment was well equipped and close to the subway for access to the whole city. 2 Bedroom Apartment Hell's Kitchen This rating is a reflection of how the property compares to the industry standard when it comes to price, facilities and services available. It's based on a self-evaluation by the property. Use this rating to help choose your stay! One of our best sellers in New York! Located in New York, an 8-minute walk from Broadway Theatre and 0.6 miles from Carnegie Hall, 2 Bedroom Apartment Hell's Kitchen provides free WiFi. Each of the units features a kitchen and a living room with dining area and a cable flat-screen TV. There's a fully equipped private bathroom with bath and a hair dryer. Radio City Music Hall is a 12-minute walk from 2 Bedroom Apartment Hell's Kitchen, while Times Square is 0.7 miles away. LaGuardia Airport is 8 miles from the property. When would you like to stay at 2 Bedroom Apartment Hell's Kitchen? Located on the lower floor of a traditional NYC building, this apartment features two double beds, two twin beds and a sofa bed in the living room. The apartment also offers a flat-screen TV with all channels, wireless internet, polished hardwood floors, standard kitchen appliances and cookware, dining table, bathroom with a shower and air-conditioning. Linens are provided free of charge. House Rules 2 Bedroom Apartment Hell's Kitchen takes special requests – add in the next step! 2 Bedroom Apartment Hell&#39;s Kitchen accepts these cards and reserves the right to temporarily hold an amount prior to arrival. 2 Bedroom Apartment Hell's Kitchen accepts these cards and reserves the right to temporarily hold an amount prior to arrival. Please note that check-in and key collection take place at: 370 west 52 street, new york 10018. The appartement needs some love and updating. The location was excellent, five minutes walk from everything!! Even though the property was very old fashioned the apartment was clean & the owners were helpful, the WiFi was very good which helped with teenagers!! Not being able to flush toilet paper for which a sanitary bin should be provided. Poorly fitting windows made bedroom very noisy. Apartment in need of modernisation. 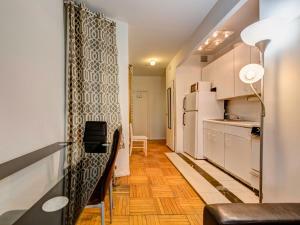 Great location within walking distance of Times Square and Broadway. The areas outside of the apartment could be cleaner. Bit it was not a problem for us as such. Very well located. Well furnished and heated. The staff is very friendly. We had a small issue with the toilet, but the owner dealt with it pretty quickly. Really great location - hard to beat at this price range. The apartment is just a few blocks away from Times Square, Central Park, MoMA, St Patrick's Cathedral, and many other attractions - as well as the nearest subway to get downtown - are also within easy walking distance. There are loads of cheap and mid-range restaurants on 9th Avenue, plenty of which are within a 5-minute walk from the apartment. There's even a restaurant recommended by Lonely Planet ('Totto Ramen') right by the door to the apartment building (although we didn't manage to eat there - the line/queue for tables was just too long!). One very quirky thing is that the horses used for the Central Park carriage rides live in stables just a few blocks to the west on West 52nd Street and the carriages are a familiar sight around the area. The apartment itself is very comfortable. Two good-sized bedrooms, each equipped with two twin beds; a bathroom with bath and shower; kitchen with gas stove and oven & microwave; and a living area with sofa, TV and a table to eat at. The owner was also helpful and flexible - e.g. he let us leave our suitcases in the apartment for several hours after checkout time, which saved us a lot of time, money and hassle. The apartment could do with new kitchen and bathroom fittings, but everything works. Only one sofa for three (there were four of us!). As ever in NY there is noise from both outside and inside the block - although the back bedroom is really quiet! Carlos, our host, was excellent - readily available and willing to help in any way. The apartment was spotlessly clean and the beds comfortable. The place is well equipped, with plenty of towels that were changed during our stay. The smell was terrible. It smelled of smoke and strong air freshener. However it was clean in the apartment. A it pricey... but I think all of New York is. Really needs an exhaust fan in the bathroom and non slip surface in the bath. Great location, close to Central Park, subway, shops, grocery store, restaurants and Times Square ...host was very helpful and easy to contact. management treatment and responsiveness was superb. Great location! Neat and clean an spacious apartment. Our plane being 3 hours late, we arrived at midnight. The owner charged us $ 100 for this late arrival. In addition, I did not know the American custom to take the imprint of our bank card and I was worried. Instead of explaining me nicely, the owner got upset over the phone threatening to deny us access to the apartment. He had only a word in his mouth "you have to pay, pay". Welcome to NYC !! His "employee" did what he could to accommodate us but it was really missed, especially since the apartment was old and dark. Fortunately we spent more time visiting the city! I do not recommend this apartment.